2014 Peugeot 308 1.2 e-THP review | What Car? The Peugeot 308 family car has struggled to make a real impact in this competitive class. However the brand has now introduced a new range of efficient engines that should help it take on rivals such as the Ford Focus and Seat Leon. The first to arrive is the new three-cylinder 1.2 turbo ‘PureTech’ petrol. Set to replace the old 1.6-litre engine by the end of this summer, it manages to be cleaner and more powerful than its predecessor. It will soon be introduced in a variety of other Peugeot models, too, including the new 108 city car, 208 supermini, 2008 SUV and 508 saloon. Eventually the 308 hatchback and SW estate will be available with three different versions of the 1.2-litre engine, starting with a naturally aspirated model with 81bhp, followed by a low-powered turbo with 109bhp. Both these cars have five-speed manual gearboxes, while the 128bhp version gives customers the choice of a six-speed manual or a new automatic. 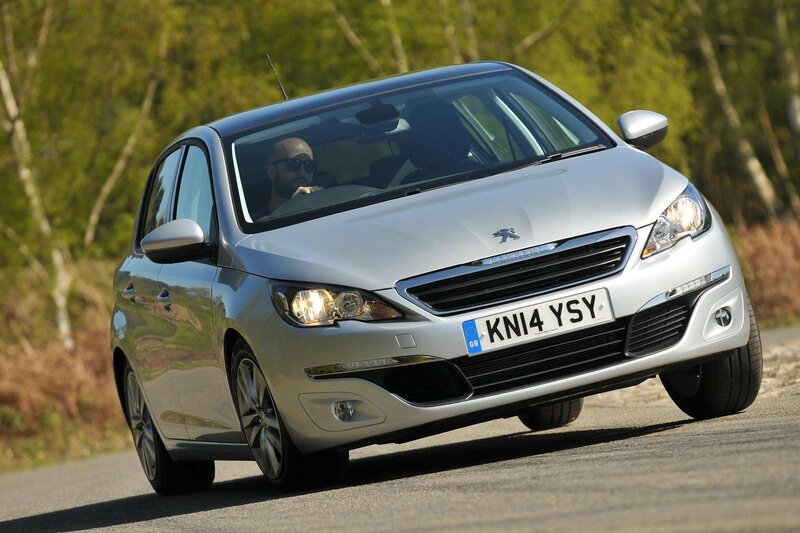 What's the 2014 Peugeot 308 like to drive? Certainly better than before. This new engine is seriously refined, even when pushed high up the rev range, and there's enough torque to ensure nippy throttle response and brisk acceleration. With 128bhp and 170lb ft it out-muscles the Ford Focus 1.0 EcoBoost and Volkswagen Golf 1.2 TSI, and 0-62mph takes just 9.6 seconds. Despite those superior performance figures, it never feels quite as eager or flexible as these rivals, though. It feels light on its feet thanks to the smaller engine, and the hushed exhaust note suits the softly sprung suspension to make the 1.2 e-THP a very comfortable, relaxing car to drive. The ride over speed bumps and drain covers was smooth on the small 16-inch alloys of our Active-spec test car. Throw it hard into a corner though and there is a lot of body roll, and several rivals strike a better balance between comfort and agility. The small steering wheel is light and quick, but doesn't always weight up reassuringly as you turn into corners. The six-speed gearbox can be a bit notchy and imprecise, which is frustrating when you're trying to make smooth progress, and there's a fair amount of wind noise from the mirrors at motorway speeds. What's the 2014 Peugeot 308 like inside? Very smart. The modern cabin has a very simple layout and a large 9.7-inch touchscreen replaces all the buttons on the dash – there are some high quality touches, including an aluminium gearlever. Active models are well equipped, with a built-in sat-nav, climate control, an electronic parking brake, DAB radio and parking sensors included in the £17,945 asking price. It takes a while to get used to quirks such as the tiny steering wheel and raised pod of dials, but the driving position is good and the seats are supportive. The clutch pedal is set too high, though, which hampers comfort on a long drive, and the glovebox is tiny. The 308 SW estate we drove recently has improved the rear legroom, but adults in the back of the hatchback will find themselves hemmed in; the optional (£500) panoramic sunroof is also best avoided, as it eats into the available headroom. The plastics used in the rear cabin also feel a lot cheaper than the classier trim near the driver. There are better hatchbacks on the market - but these new engines do help boost the 308's appeal. It's one of the cheapest cars to run in this class, and private buyers after a comfortable, affordable family car with a petrol engine should definitely put the Peugeot on their shortlist. The soft-edged handling means it's not as fun to drive as a Seat Leon or Ford Focus, and despite the big boot the interior is a bit too cramped for adult passengers on longer trips. A new 1.6-litre diesel with CO2 emissions of just 82g/km is due to arrive in June, and we suspect that the estate model fitted with this engine will be the pick of the 308 range. We'll let you know for sure nearer the time.